"I just got that tingle, similar to when you're sitting in Goodison"
I was asked to write a few lines about the Legend's night that happened recently in the Red Cow Hotel. I've just joined the Irish Toffees and for me it was a great chance to meet other Blues and also see one of my idols, Joe Royle. I arrived early and met with a few of the Irish Toffees committee. 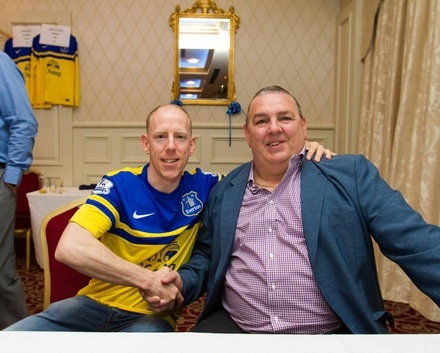 'Sold to the guy in the Blue jersey' - Radio City/Everton Stadium Announcer ran the excellent memorabilia auction. Joe Royle such a Legend on the pitch, in the dug-out, and at events! Straight away I felt almost at home, to be surrounded by fellow Blues and to be able to talk freely about all things Everton. We were then ushered into the room where the event was happening, all around the walls was Everton memorabilia. Z cars rang out and I just got that tingle, similar to when you're sitting in Goodison just waiting on the team to come out. I sat at the table with complete strangers but within minutes we were all chatting away as if we had known each other for ages, everything Everton was discussed from transfers to possible sales to how well Roberto was doing. The was one common theme and that was Everton. So the night began and both of the Legends were introduced, to applause and whistles. We truly were in the presence of the fabric of Everton, 2 Giants in there own respect of Everton Football club along with the F.A. Cup adorned with blue ribbons. The night really gathered pace as stories were told by both Joe Royle and Big Nev. Big Nev being his brutally honest best and Joe Royle telling us about his days as both a player and a manager. I found Joe to be quite funny and some of his tales were very funny. So after a while a break was called, photographs and autographs taken with both Joe and Big Nev and both were delighted to do it. Then the 2nd half began and there was questions from the floor, everything from their opinion on the state of grassroots football in the UK to should Ross Barkley be sold if a bid of 40 million or more was offered, to their opinions on Bill Kenwright, and some of the answers I think surprised a lot of people. I'm not doing this night a justice as if I was to put down in writing everything that I enjoyed about the night this would turn into a book. With it being my first Irish Toffees outing I really enjoyed it, the committee that organised this really went above and beyond and if this is a sign of things to come I'll certainly be at the next Irish Toffees outing. Thanks for a great night lads. Colm.